Photo: Jesús Renedo / GC32 Racing Tour. 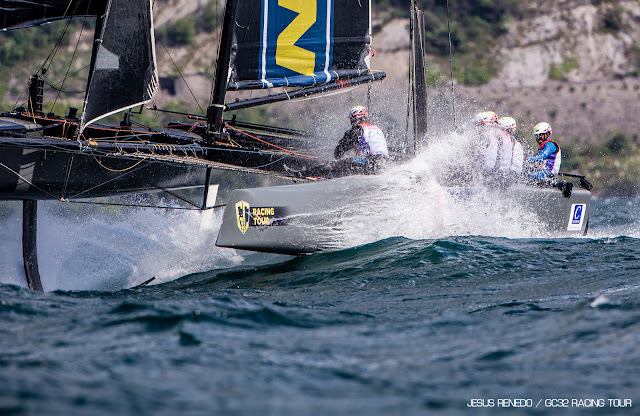 - The European GC32 Racing Tour is currently 'creme de la creme' of the sailing circuits. Not only they select venues for having best sailing conditions possible but they also race the GC32 weapons. Best boats & top venues , nothing else needed. Garda Cup will first race and debut for my good friends of Código Rojo Racing Team, the first Argentinean team joining the tour. Iker Martinez will be present also with Movistar team. Check below press release sent by GC32 Racing Tour. "With the GC32 Riva Cup on Lake Garda starting tomorrow with teams from eight nations, the GC32 Racing Tour has saved the best for last with today’s announcement of a titan of sailing as its eleventh entry. With a giant, diverse CV, Spain’s Iker Martinez is best known for his gold and silver 49er Olympic medals as well for skippering Team Telefónica in the 2011-2012 Volvo Ocean Race and sailing double handed round the world non-stop in the 2010 Barcelona World Race with his long term sailing partner Xabi Fernandez. For 2017, Martinez and his I’M Racing Movistar will be competing on the GC32 Racing Tour with a special focus on Spain’s leading regatta, Copa del Rey MAPFRE, to which the GC32 Racing Tour will return for a second consecutive year. Sailing with Martinez are several Spaniards, notably Anton Paz, the ‘last’ Tornado catamaran Olympic gold medallist, as mainsail trimmer; Fidel Turienzo, who last year was top Spanish finisher in the Mini Transat singlehanded offshore race and big boat and Olympic Star sailor Fernando Rivero. Also on board is Portuguese sailor Luís Brito, who raced on the Sail Portugal GC32 last year on the Extreme Sailing Series. “I am very happy with them,” says Martinez. “We know we are late and that crews who sailed in the last years have learned a lot. We know that it will be painful initially in Garda – but we just have to launch into it and learn as quickly as possible. With GC32s having recorded momentary peaks speed of around 40 knots over the last fortnight, so new for 2017 will be the pioneering Anonimo Speed Challenge – speed trials that will take place daily when conditions allow, with backing from the GC32 Racing Tour’s new timing partner, Anonimo. Anonimo was founded in 1997, by enthusiasts keen to maintain Florence’s watchmaking tradition. Through its ethos of innovation and technical expertise, the company developed many pioneering watches and resulting patents: for example it was one of the first watchmakers to make use of bronze, including in it diving watches. In 2013 Anonimo relocated to Switzerland, but retains its core philosophy and its strong association with adventure, team spirit and freedom. Celebrating its 20th birthday this year, Anonimo continues to refine its style and assert its independence, combining Swiss precision with Italian chic. It now has two ranges ‘Militare’ and ‘Nautilo’. While the first Nautilo watch was made in 2006, the latest models are a contemporary reinterpretation of the famous diving watches designed by Dino Zei. Their principle identifying mark is the crown at 4 o'clock – which is, in the opinion of many divers, is the most comfortable position for the wearer. The famous triangle, with its points at 12, 04 and 08 o’clock, appears on the facia recalling, both at day or night, on land or sea, the 'A' of Anonimo. A new adventure for the GC32 Racing Tour, the Anonimo Speed Challenge will see the foiling catamarans set off from the start line on a reach, will gybe around a mark and then reach back to the finish line. According to the GC32 Racing Tour's new Principal Race Officer, Stuart Childerley, the aim is for complete runs to take around two minutes. The runs will be timed and their average speeds recorded. To achieve top speeds, which will be above 30 knots conditions permitting, will require supreme team work on the part of the crews. The team with the fastest speed will be presented with an Anonimo Nautilo timepiece at the end of each event.